16 year-old YPJ fighter Barkhodan Kochar from Darbasi, Syria. This case study is part of the Dignity Campaign, an initiative of the Working Group on Preventing & Addressing Structural Violence Against Women. Inspired by the Arab spring, the Syrian revolution began in March 2011 with mass protests demanding basic political freedoms and reforms. The government’s swift and brutal response to the mass protests was far from politically logical. As a result, what started as a peaceful revolution turned bloody, and a civil war has ensued, where regional powers are engaged in a proxy war. Numerous groups compete for control, and the country is divided into areas of control by government, opposition, and extremist groups. This contribution to the 2015 Dignity of Women Campaign (for ICAN’s Working Group on Preventing and Addressing Structural Violence) sheds light on events in the Kurdish areas in Syria during the ongoing civil war. Kurds have suffered serious injustices from the Assad regime, the free army, and from ISIS. Kurds have even suffered in the areas of control under the Kurdish Democratic Union Party (PYD – “the Party”) as result of the PYD’s support for the Assad regime. The repression of peaceful demonstrations in the Kurdish areas since the beginning of the Syrian revolution, arbitrary arrests of activists, and forced exile of many reporters and media activists are some examples of how Kurdish communities have suffered. Also, independent civil society activism that is not associated with or does not support Party politics is greatly restricted or prevented. Political assassinations are proliferating with the aim of preventing the population from protesting. Laws and decisions have been adopted which disregard the opinions of the public, particularly the opinions and interests of the youth. Ironically, agendas which don’t necessarily correspond with the interest of Kurdish citizens are imposed, even though the PYD is in power because those citizens took risks and protested in the first place. It should be noted that the PYD party has declared that it opposes the establishment of a Kurdish state, which many believe is in violation of the people’s right of self-determination. Despite all the concerns related to the violence outlined above, one PYD practice stands out as especially concerning to women and human rights groups—the recruitment of underage girls for militant groups. A child soldier is defined as “any person below 18 years of age who is, or who has been, recruited or used by an armed force or armed group in any capacity, including but not limited to children, boys and girls, used as fighters, cooks, porters, spies or for sexual purposes.” (Find more info at https://childrenandarmedconflict.un.org.) The region has witnessed many cases of illegal recruitment of underage girls and boys in violation of international human rights. The party has both direct and indirect recruitment practices: “The party directly, through the issuance of conscription law [Decree No. 15], sends a notice to families who have young men or young women between the ages of 18-30 years to report to the Recruitment Division.” There are exemptions for families with only one child, with a family member in the Party, or have already lost someone in military actions. The indirect recruitment method for teenage boys and girls under the age of 18 is psychological recruitment. Usually, someone charismatic and impressive from the Party tries to meet underage teenagers in an attempt to recruit them voluntarily. Such meetings can take place in Kurdish language learning centers, internet cafes, schools, and popular gathering places. Recruiters have the specific objective of attracting as many underage girls as possible, bonding with them about the injustices committed against the Kurdish people for thousands of years. They talk about the dream of a Kurdish state, a dream now achievable with their participation in fighting and taking up arms against the enemies of Kurdistan. Girls separated from their families and lacking their families’ protection. Social stigma associated with spending time among males. Young recruits help militias win over public and youth opinion. Finally, recruiters exploit teenagers’ complicated relationships with their parents, which is a normal phase for teenagers. Teenagers may threaten their family to join the Party and to take part in the armed conflict. Most teenage girls who join the Party have family problems –most of the cases we have had contact with joined as a result of family disputes. Teenage girls join the Party to take up arms and drive a military vehicle, which is the dream of every teenager. Where the force of arms prevails, every teenager girl wants to prove her worth and impose her will upon her family. But the main reason for the Party recruitment of underage girls is controlling the streets. In conservative communities, the concept of honor is associated exclusively with the girl. A girl’s disobedience and leaving the family house is a stigma of disgrace the family has to live with forever. What happens usually is this: When a family opposes the policies of the Party, the party tries everything to attract one of this family’s girls to join military action and carry arms, which forces the family to acknowledge that their daughter is in the ranks of the Party. Out of fear of social condemnation (such as the accusation that their daughter has eloped with a young man), families feel forced to support the Party. Recruiting underage girls to bear weapons is also a policy adopted by the Party to subjugate families who reject Party policies. Even socially-prominent families who oppose the party run this risk, as was the case with the ‘Edi family and their 15-year old daughter, Hamreen. Hamreen’s family stands against the Party. 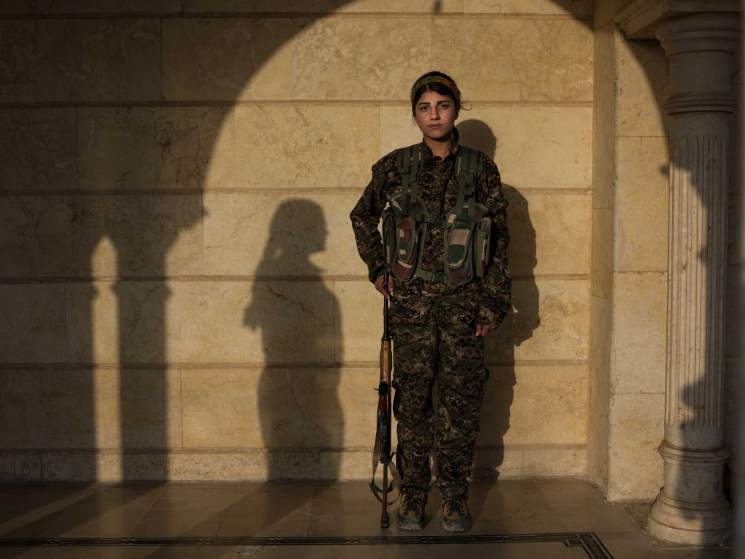 Hamreen’s father died and she lived with her stepmother until recently, when she voluntary joined the ranks of the People’s Protection Forces (YPG, the military branch of the Democratic Union Party). On December 23, 2014, Hamreen (born 1999) left her house heading to her secondary school, and never returned. When her family started looking for her, her brother Marwan ‘Edi reported to the Asayesh (a security establishment operating under the Democratic Union Party). They asked him for his phone number and promised to contact him as soon as they obtained any information regarding his missing sister. Several days later, the missing Hamreen contacted a friend to say that she is now in a military camp run by the YPG. When Marwan ‘Edi heard the news that his sister Hamreen was in the YPG military training camp, he demanded that those responsible release his sister, but the YPG denied that she was in their camp. Marwan, joined by other families who oppose the Party’s policies of attracting teenage girls and boys, demanded the girl’s release, but the party kept denying her existence in the camp. Later, the YPG announced that Hamreen had joined them voluntarily and claimed that she was 18 years old. Social shame: Any girl who leaves the family home is an indication of a problem, causing a sense of shame to the family. A rebellious girl is unacceptable in a conservative society; therefore, most families hide the disappearance of their daughters. Fear of the party’s reaction to the family’s protest, since there is a harsh repressive history by the Party against civilians. For these reasons many families remain silent and they refuse to talk about their daughters joining military actions with the party. Children under the age of 18 are not fit to bear arms, as they are legally considered children. The Party manipulates the feelings of these girls in order to recruit them, exploiting their impoverished economic, social and psychological conditions which are the result of the war. Children should be sent back to their families, not used to serve the Party’s interest. Respect the Universal Declaration on Human Rights and abide by the Optional Protocol to the Convention on the Rights of the Child (concerning the involvement of children in armed conflict). Immediately demobilize these underage girls and boys and send them back to their homes. Stop the practice of political repression against the people. Exert pressure on the Party to comply with international law. Support organizations defending human rights and protecting children. Offer support and assistance to organizations working to spreading awareness of human rights. Understand what is happening and how cultural practices that discriminate against girls and women are being utilized to subjugate these girls; begin to raise awareness among the population about women and girls’ rights. Demand the Kurdish political parties stop recruiting underage children as soldiers, particularly in discussions of support for militias to fight ISIS. Raise awareness about the unethical practices of Kurdish political groups among communities.